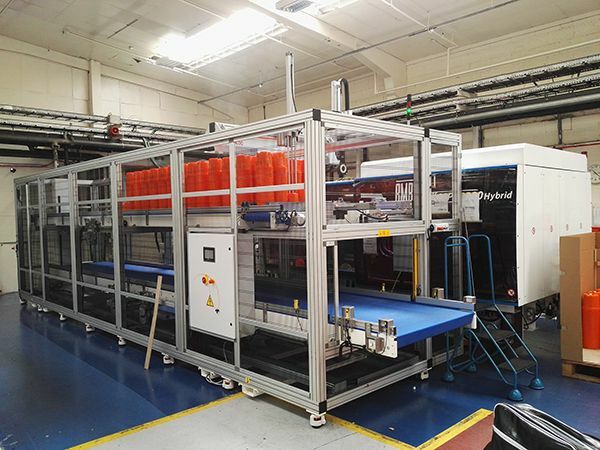 Over several years Virginio Nastri (available through Renmar Plastics Machinery) have provided several automated product handling systems in conjunction with STAR and BMB for Desch Plantpak in Maldon, Essex. Earlier this year it was decided that Desch Plantpak and Virginio Nastri would work directly to design a new multi-layer product handling storage conveyor. This was successfully installed in August and has provided the customer with a system that allows them to run virtually a full shift in a “lights out” environment. The critical part of the design was that the lift/ stack conveyor could handle several different diameter and height plant pots, then successfully transfer them to the double deck holding conveyors. The products are placed on the lift conveyor by the robot, then indexed to cater for several cycles before transferring the products which are again indexed on holding conveyors for maximum storage. The system is fully guarded and interlocked both to the robot and the machine. The unit has been a great success and Desch Plantpak are considering upgrading some of the older systems to the new version during 2019. For further information please contact Renmar Plastics Machinery (info@renmar.co.uk) the UK distributor for Virginio Nastri Srl.